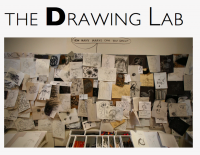 MAKE YOUR MARK and DRAW in the Drawing Lab! Come DRAW and EXPLORE with artist, Deb Putnoi. You will: Draw to music and different sounds; Draw using your sense of TOUCH as your guide; Experiment with DIFFERENT DRAWING MATERIALS; Draw on different kinds of papers and surfaces. This workshop is for EVERYONE to DRAW: young and old, experienced artists and beginners. It is for those who love to draw and for those who may be afraid to draw.